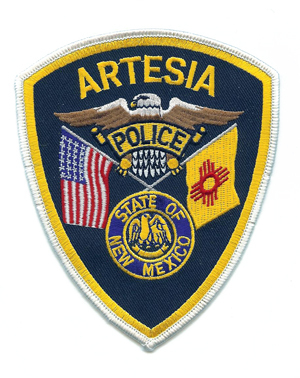 It was a busy few days for the Artesia Police Department, as officers made several arrests between Saturday and Tuesday on charges ranging from DWI to attempt to distribute narcotics to vehicle theft. On Saturday, APD officers were dispatched just after 5 a.m. to First and Main streets in response to a three-vehicle accident involving a semi. Upon arrival, officers noted three pickups parked along a curb on South First Street, two bearing visible damage. A semi was stopped in the eastmost southbound lane. Police spoke with the driver of the uninvolved pickup, who had witnessed the accident. According to the complaint, he told police the light had just turned green for north- and southbound traffic on First Street and the semi was proceeding through the intersection when a grey Dodge pickup stopped at the eastbound light on Main was struck from behind by a silver Dodge pickup, pushing it into the side of the semi. The driver of the silver Dodge, identified as Jeffrey Thomas Collins, 29, of Weatherford, Texas, told police the grey Dodge had “hit its brakes suddenly” in front of him. As officers spoke with Collins, they detected a faint odor of alcohol and noted he was swaying on his feet and his eyes appeared watery. Police administered a field sobriety test, and Collins was subsequently arrested for driving under the influence. During a search of his person, police found a used needle, straw, and several plastic baggie pieces, some of which contained a white, powdery substance, in a pocket of his jacket. According to the complaint, Collins told police the substance was steroids. After being transported to the Artesia Detention Center, he admitted the substance was actually cocaine. A breathalyzer test was administered, with Collins blowing a .17 and .18. In addition to aggravated DWI, he was charged with possession of a controlled substance. He is scheduled to appear Oct. 24 for preliminary examination before Judge Daniel Reyes Jr. in Artesia Magistrate Court. Sunday evening, police arrested a local man for his third DWI offense. Officers were dispatched around 6:45 p.m. to the area of 12th Street and Richardson Avenue in reference to a male individual possibly driving under the influence of alcohol. John Bratcher, 30, of Artesia, was arrested after a field sobriety test yielded probable cause. Inside his vehicle, police found a .22 caliber revolver in the passenger side door and three open containers in the passenger floorboard, with a fourth in the back of the vehicle. Police administered a breathalyzer test at the Artesia Detention Center, with Bratcher blowing a .19 and .17. He was subsequently charged with DWI (third offense), open container, negligent use of a deadly weapon, expired plates, no proof of insurance, and non-functioning headlamps. He is scheduled to appear Nov. 14 for pretrial conference before Reyes in Artesia Magistrate Court. On Tuesday afternoon, an officer on duty at Park Junior High School was called to the principal’s office in reference to a student who had sold a pill to another student. A teacher at the school had observed Julian Tafoya, 15, of Artesia, pass a pill, identified by police as Clonazepam, to another student. While the officer was looking up the proper charges for the schedule-4 drug, Tafoya stood, grabbed the pill from the principal’s desk, and stated he was going to “pop it,” before placing it in his mouth. According to the complaint, the officer placed his hand under Tafoya’s jaw in an attempt to prevent him from swallowing the pill. Tafoya managed to swallow it, then attempted to pull away from the officer before he was subdued with the assistance of the principal. Following a “small scuffle,” Tafoya was placed in handcuffs. Once brought to his feet, the complaint states, he spit into the face of the officer. He was transported to Artesia General Hospital due to having swallowed the pill and was charged with unlawful possession of a controlled substance with intent to distribute, tampering with evidence, battery upon a peace officer, and resisting, evading or obstructing an officer. That same evening, around 5:30 p.m., officers were dispatched to the area of JJ Clarke and Centennial drives in reference to a report of a stolen vehicle. Police were advised the owner of the vehicle, a green, 1994 Jeep Wrangler reported stolen from Carlsbad, was following it. In the area of 13th Street and Bush Avenue, police spotted the reporting party, who gestured to a Wrangler driving up ahead. Officers initiated a traffic stop on the Wrangler at 13th Street and Chisum Avenue and made contact with the individual driving, identified as William Casey Ellis, 19, of Artesia. According to the criminal complaint, Ellis told officers the vehicle belonged to a friend, and he had gone to retrieve it at the friend’s request because it was stolen. The owner of the vehicle stated he did not know Ellis and had not asked anyone to retrieve his stolen vehicle. Ellis was subsequently searched and a baggie containing a white, crystalline substance found on his person. The owner of the Jeep told police he had been contacted by an actual friend, who told him he had seen the Wrangler driving in the area of 26th and Main streets. The owner was able to spot the vehicle and began following it. Inside the Jeep, officers found a bag of clothes, a makeup bag, a smoking pipe, and a knife that did not belong to the owner. Police also found various cards, including driver’s licenses from New Mexico and Arkansas bearing two different names, bank cards, and other miscellaneous cards bearing various names. Ellis was arrested on charges of receiving or transferring a stolen motor vehicle and possession of drug paraphernalia. The cards were turned over to the Criminal Investigation Division for further investigation.